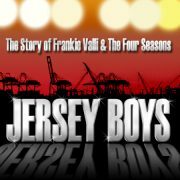 Jersey Boys is a jukebox musical showcasing the songs and story of one of the most popular rock’n’roll bands of the 60s, Franki Valli & The Four Seasons. The show tells the story of how the band formed, their love lives, their songwriting, their troubles and ultimate break-up. The show is written by Bob Gaudio, one of the members and songwriters of the Four Seasons, with lyrics by Bob Crewe, their producer, and book by Marshall Brickman and Rick Elice. The show opened on Broadway in 2005, winning four Tony awards in 2006 including ‘Best Musical’, and is still running now, having played nearly 3,000 shows. The show toured North American in 2006-7, and opened in Las Vegas in 2009 where it is still playing. Jersey Boys opened on the West End in 2008, where it is still running, having won the 2009 Olivier award for ‘Best New Musical’. It has also played Sydney, Melbourne, Toronto, Singapore and has had a international tour.